Being a novice at cake making and decorating, I think this is something I can do with my strong desire to create their 'dream cake, the proper tools, and, a well conditioned limb! I have ordered the Petal (Wilton #s 127 and 127D) and Ruffle (Wilton #s 402, 403 & 406) decorating tips. I plan to practice with these tips on a practice cake foam until I find the piping tip that will give me the closest look of the icing on the cake. Do you have a suggestion as to which would work best? As for the frosting, other experienced bakers suggested buttercream icing. Should I use stiff consistency or the medium consistency buttercream? And, do I pipe the icing on crumb coating or need I spread a second smooth coat on the cakes before piping the tiers of ruffles? Also, can these undercoatings be a white chocolate cream cheese frosting rather than buttercream? 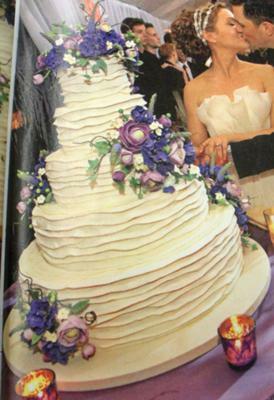 Answer:That is a beautiful cake. I have done a couple of cakes using a similar concept. They are pictured above. One is made using strips of fondant. It looks as though this cake may also be fondant, but very thinly rolled. work best. And yes you can use cream cheese or white chocolate buttercream underneath the ruffles. I would suggest either using a variety of basket weave tips (if you want to recreate the flatter version (mine) or the rose petal tips as you are already practicing. If using the basketweave ones use the smooth side facing up. (turn the tips over, the opposite side is smooth.) 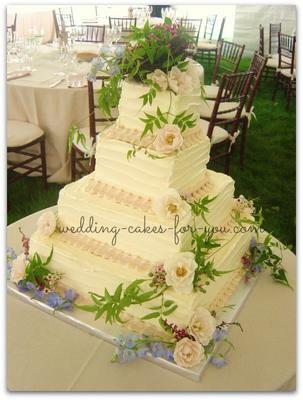 Use the smaller sizes for the top tier and larger as you go down to the bottom tier. The square cake was done by running a spatula along the buttercream after it was applied. The royal icing on my cake decorating icing page, or buttercream frosting, or another version here of Italian Meringue buttercream which is a little more work but more stable. You may have to add more powdered sugar to the royal icing. The butter cream has to kept cool or they will not hold form. I don't usually suggest using Crisco based frosting but this is another option. The cake decorating frosting, which is a Wilton recipe and will not melt like buttercream in the heat, or by the warmth of your hand on the bag. This is probably the safest one to use. But I hate the thought of eating Crisco. I have heard of people mixing half Crisco and half butter and mixing it together. You may want to try that. I hope this helps and I wish you the best of luck. If you have more questions feel free. We will look forward to your cake photo. I don't know ho long ago this post was, but I wanted to comment on it anyway because the cake in the photo I actually worked on. All flowers and ruffles are made from gum paste and fondant respectively. I really don't think that you should try to recreate a cake that was done with such detail in one medium (gum paste/fondant)for a creamed medium. You will not get the same results. 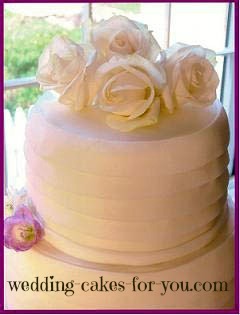 The best tip if you wanted to do a cake with ruffles would be a rose tip. Depending on the size of the ruffles you want that will be the size tip you use. But I think that you should model after a buttercream cake. Hi Anonymous. Thank you for adding the feedback on the ruffled cake. Can you tell us where the cake came from so I can give it the proper credit? Its very beautiful. And thanks for letting us know exactly how you did make it. I added a buttercream version that has a similar idea although not nearly as detailed, that I made recently.